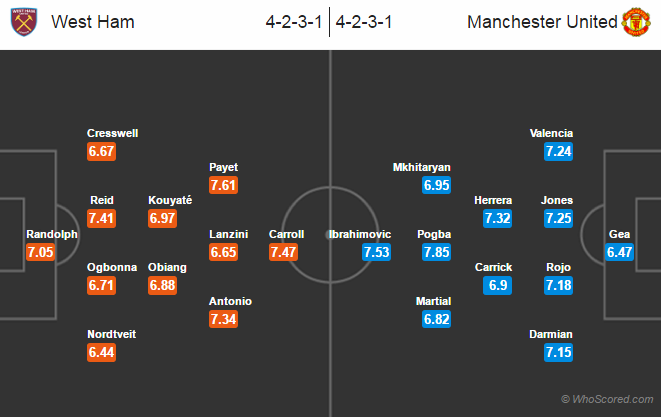 Possible Lineups, Team News, Stats – West Ham vs Manchester United. Premier League match preview. Referee: Mike Dean, Stream Guide: Watch Live. Mark Noble is out through a knee injury he suffered against Leicester on Saturday. Pedro Obiang and Edimilson Fernandes are set to fight to get the starting role. Alvaro Arbeloa and Arhur Masuaku both are out for a month. Reece Oxford and Sam Byram have returned to training but are not expected to feature. Simone Zaza will not take part in the game as he is expected to return to Juventus this month. Man United will be without Eric Bailly as he is now preparing for Africa Cup of Nations. Wayne Rooney is a doubt through thigh injury. Michael Carrick could start as he has returned from illness. Marcos Rojo and Phil Jones are likely to get starting berth. Anthony Martial was impressive against Middlesbrough, he might get another start. Manchester United have won five consecutive Premier League games. Man United have lost only of their last 15 games against West Ham in all campaigns. West Ham have won three of their last five league games. Last three of the six games between these sides have ended as draw. West Ham 1 – 1 Manchester United, the visitors are likely to drop points after impressive winning streak.